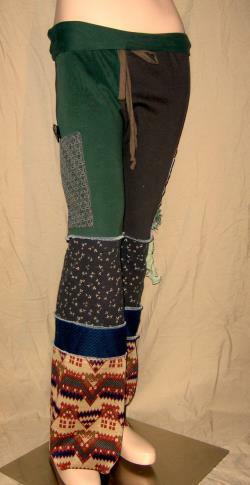 These pants are so sweet made from an assortment of upcycled cotton knits including deep chocolate brown cotton, ivy green knit, ecru leaf print on deep chocolate waffle knit, navy blue/ black basket weave cotton knit and earthy navajo knit. 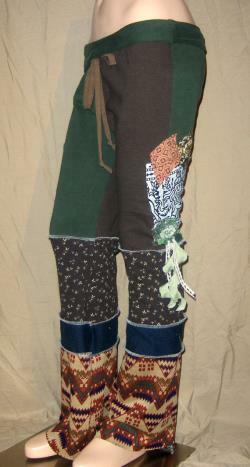 They have a drawstring/ fold-over waist band, a nice roomy geo-print fully lined cotton pocket with a carved horn fish button. 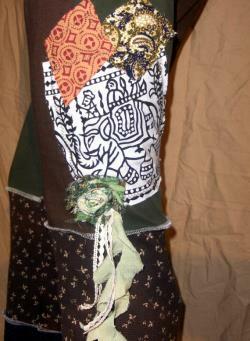 There is also an applique made of indian block print cotton featuring an exquisite elephant surrounded by two more patches, a scrappy rose and linen and vintage lace fringe tassels. These are a size extra small/ small and measure as follows. Waist - 16" unstretched and 18" stretched. Hips - 18.5" unstretched and 21.5" stretched. Inseam- 33.5 with a raw hem. Bottom leg opening width is 11. Rise (not including fol-over waistband)- 9. All measurements are taken flat and should be doubled. Please feel free to convo me with any questions.